One Fifty One at Biscayne was envisioned as part of a $3 billion mixed-use residential community to be built as a public/private venture being developed in cooperation with the City of North Miami. It was the vision of one of South Florida's largest and most respected development companies - Boca Developers. When members of the firm decided to build an upscale community of new condos, they stated that one of their main objectives would be to take advantage of the open spaces, the views and great recreational opportunities afforded the One Fifty One at Biscayne site. They recognized that nowhere else in the eastern parts of Dade, Broward and Palm Beach counties was there a property encompassing so much land. With an immense recreation area, over 2,000 acres of trails that wind through the Oleta River State Park, One Fifty One at Biscayne is truly a one-of- a-kind property. But Boca Developers had not counted on the worldwide real estate crash, and after building the first two condo towers, they eventually lost the property. A new developer has taken control of the remaining acreage and is putting together their plans together for the ultimate development of the rest of this community. 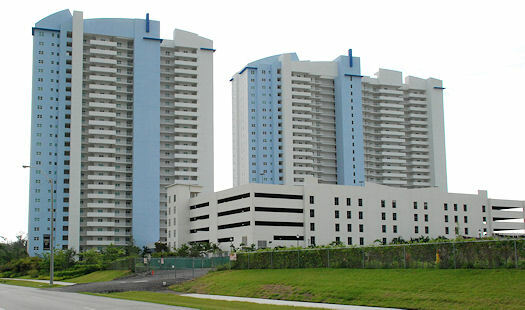 These are the first two condominium towers built at Biscayne Landing.